The incident began 5 hours earlier when Lepage first contacted Race HQ to report that Laaland’s mast had broken in two places while sailing in 25knot winds and 3 metre seas. 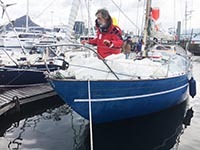 After cutting away the rigging, the 62-year old sailor from Vannes, expressed some concern that one section of the mast may have damaged the hull near the keel, but that the initial ingress of water had stopped. He did not ask for assistance and was planning to set up a jury rig at first light on Sunday and sail to Fremantle unassisted. That all changed at 18:10 UTC when Lepage made a second call to Race HQ to say his yacht was now leaking at the rate of 30 litres of water an hour from an area in the keel hidden from view by a water tank. His pumps were working and keeping up with the flow, but conditions outside had deteriorated, with winds of 40 knots. 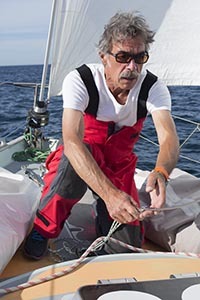 Loïc Lepage – highly experienced with three solo transatlantic crossings under his belt before the Golden Globe Race. The Joint Rescue Coordination Centre in Canberra, which had already been alerted to Laaland’s CODE ORANGE situation earlier, intercepted her IPIRB signal at 18:30 UTC and immediately issued a MAYDAY relay alert to all ships. 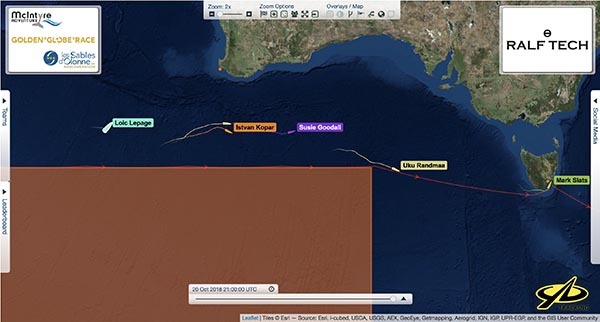 A Challenger search and rescue plane has been despatched from Perth and was expected to reach Laaland’s position at 23:00 UTC. Her crew will communicate with Lepage over VHF radio and photograph the condition of the yacht, which has the rig still attached at the bow, acting as a sea anchor. The nearest GGR yacht with an engine is Puffin skippered by American/Hungarian Istvan Kopar, which is some 480 miles downwind to the east. The strong westerly gale force winds in the area will almost certainly make it impossible for Kopar to turn back upwind for another 24 hours. Another solo yacht, Alizes II sailed by Francis Tolan in the Long Route solo circumnavigation, is some 350 miles NW of Laaland’s position and GGR Organisers are attempting to contact him. Laaland’s position at 19:00 UTC was 39 1.117S and 104. 1.67E making 1.2K on 45T. Lepage has reported that all safety gear is secure, his emergency sat phone is working and the yacht’s tracking equipment is fully charged. 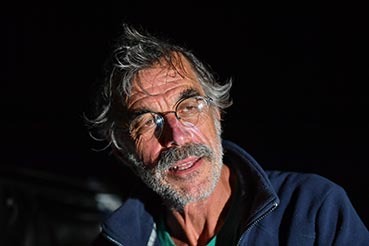 At 00:00 UTC wind and sea conditions are forecast to moderate and by 12:00 UTC on Sunday are expected to be back to 20-25kts from the SW.
Loïc Lepage is a highly experience solo yachtsman, having made three transatlantic crossings and spent the past three years preparing his Nicholson 32 yacht Laaland for the Golden Globe Race. Problems with his radio and a shortage of fresh water forced him to make a stop in Cape Town, which left him demoted to the Chichester Class (for those competitors forced to make one stop or receive outside assistance). But he has continued ‘to realise my dream’ to sail solo around the globe. The GGR Race organisers are polling Laaland’s position every 30 minutes and maintaining a 2-hourly satellite phone check with Lepage to monitor the situation. TV VNRs and hi.res photographs will be available to download from the GGR Press Login page goldengloberace.com/press/ If you have not yet registered, do so now to access these copyright free media assets and receive regular press updates on the Race.